The limestone rock in the danish underground is lying high a belt from Thy through Himmerland and Djursland and continues through Mid-Seeland to Mon. Near the city of Ålborg you can see the limestone in slopes along the highways. Limstone quarries can be seen in many places in Himmerland. The limestone is used in the cement-industry and to improve the agricultural fields. A very fine limestone - chalk - is used in schools. Exposed limestone rock is especially seen at the coast eg. in Thy, Djursland and Mon. But also in land in the river valleys it sometimes can be seen especially in Himmerland. Lime-rich soils has some characteristic porperties that is reflected in the vegetation. The soil is poor in nitrogen and very alkaline which makes it difficult for the plants to absorb certain nutrients from the soil. A large number of rare plants including several species of orchids grows only on lime-rich soil. 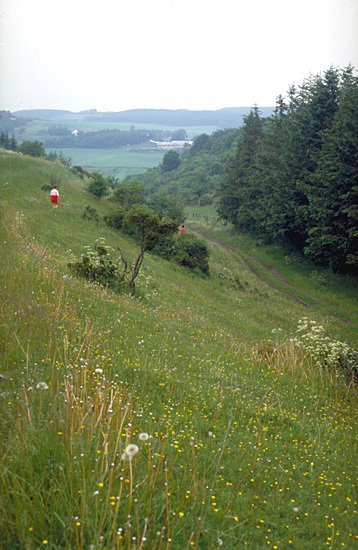 At several places in Himmerland the special limestone vegetation can be seen. In a side valley to the Lindenborg Å river valley one of the most unique botanical locality in Denmark can be found. The valley is now a protected nature reserve and is grazed by a bull ! Back to Danish Nautre and Vegetation.